How often do you get a real shot at winning $20,000? In 2014, John Pohly, a real estate agent and solopreneur from Austin, Texas, was presented with an opportunity of a lifetime. 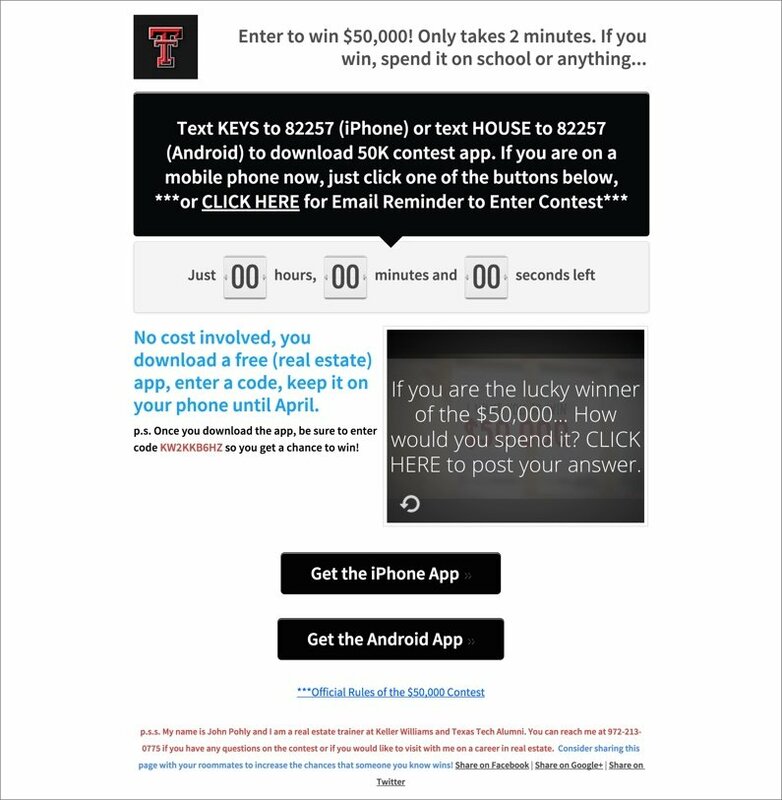 His employer, Keller Williams Realty, set up a contest: the agent who got the most potential leads to download the Keller Williams mobile app would win a grand prize of $20,000. As a real estate and lead-generation veteran, John wasn’t lacking in confidence or ability. But he knew winning wouldn’t be easy. For one thing, he’d be competing against 100,000 other Keller Williams agents. For another, Keller Williams had set up a somewhat cumbersome download process. In order for the agent to be credited with the download, each lead would have to enter in the agent’s unique—and very lengthy—alphanumeric code following the download. There was a potential payoff for those leads: they’d be entered in a drawing for a $50,000 prize. But John calculated that entering his code would require them to press 15 different buttons, without making a mistake. That’s asking a lot of any customer, and John was worried. So before entering the contest, he tested 20 of his family members to see how many of them could correctly complete the app download and enter his unique code. The results were grim: only 4 of those 20 family members—people who would be, if anything, more motivated than average to finish the task and help John out—were able to complete the download and give John credit as the lead generator. What’s more, the landing page Keller Williams had created for leads to opt for the download wasn’t ideal. John wasn’t able to customize the copy, and it wasn’t mobile responsive, frustrating anyone who tried to opt-in on their phones. John knew he needed to find a better process to win the contest. Luckily, he had a strategy in mind: combine his Facebook-advertising smarts with the power of LeadPages®. Easy customization: John needed to deliver ultra-clear instructions for the opt-in process. He could add those to his landing page immediately with LeadPages®’ click-and-type landing-page builder. Mobile responsive templates: Every LeadPages® landing page immediately adjusts for an optimal view on mobile devices, so John didn’t have to worry that key elements wouldn’t work on leads’ phones. Conversion rates, front, and center: Using his LeadPages® dashboard, John could immediately analyze traffic and registration rates so that he could adapt in real time. With a landing-page strategy in place, John began crafting his sales funnel. He designed a series of hyper-focused Facebook ad campaigns to funnel traffic to customized LeadPages® landing pages—more than 30 in all. For example, when John targeted Texas Tech students via Facebook, they’d see a LeadPage™ adorned with the Texas Tech University logo. Other groups he targeted included Texas retail employees, school teachers, and engaged couples. But for every group, a few key elements of the landing page remained the same. John included detailed instructions on how to download the app and where to enter in the agent’s unique 15 characters, alphanumeric code. Mobile users had a choice of two call-to-action buttons that would send Apple users directly to the App Store and Android users to Google Play. Leads who were not using their mobile device would be directed to enter their name and email address into a LeadBox™ so they could receive an email with download instructions. Considering the competition, that’s no exaggeration. Fewer than 100 agents received even 100 downloads, and only three topped 1,000 downloads. Maybe you’re in a totally different industry than John. And maybe no one’s dangling a $20,000 grand prize in front of you. But every entrepreneur is competing for leads with someone. And many entrepreneurs find themselves hampered at the outset by overly complicated, one-size-is-supposed-to-fit-all lead-generation tools. Yes, John’s expertise at Facebook marketing helped him take home the grand prize—but if he hadn’t thought to pair that expertise with LeadPages®’ simple but high-converting landing pages, it would have been much harder to pull ahead of the pack. You may well be able to mimic some of John’s incredible results simply by giving LeadPages® a try—but we’re not stopping there. 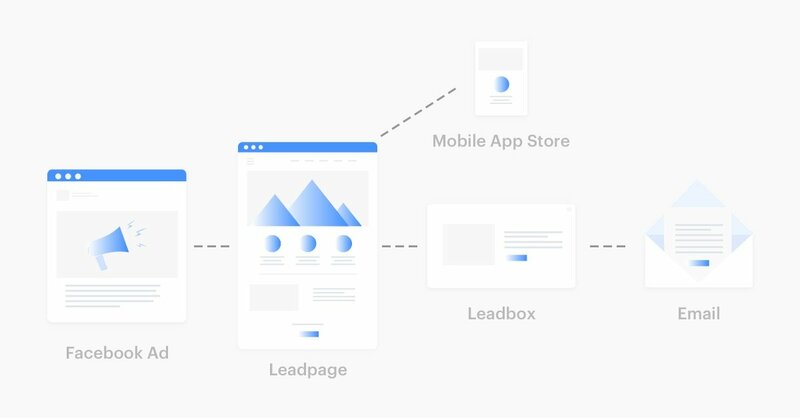 John’s been generous enough to break down his entire campaign strategy and sales funnel for us at LeadPages®, and we thought you’d be as excited to see it as we are.